At The Blind and Shutter Store, your satisfaction with your window coverings is our top priority. 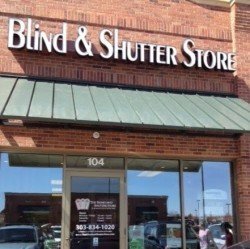 We provide exceptional shutter & blind repair, installation, and even shutter and blind cleaning services to the greater Denver, Colorado area.The Blind & Shutter Store is an exclusive Hunter Douglas dealer and carries all Hunter Douglas products including faux-wood blinds, sheer shadings, and plantation shutters. Call our Denver-area showroom for details on our comprehensive blind & shutter service. Whether you need a simple blind repair, an entirely new shutter installation, or simply need a thorough shutter or blind cleaning, our blind & shutter experts have all your blind and shutter solutions. With our perfect fit guarantee, we make purchasing window coverings worry free. We also offer professional blind & shutter installation, performed by the most professional and courteous installation and repair technicians in the Denver area. Your windows are the “eyes” of your Denver home. Don’t let broken blinds or jammed window shutters make it difficult to see the beautiful Denver views outside your home. The Blind & Shutter Store offers affordable, efficient window shutter and blind repair services to make sure your window coverings are doing what they’re supposed to–allow you to see outside, while protecting your privacy from those looking in. Dingy drapery or shades can have an affect on the entire visual aesthetics of your home. Don’t stress over deep cleaning of draperies, window shades, shutters, or window blinds, let The Blind & Shutter Store do the dirty work for you, so you can enjoy the picturesque Denver views right outside your windows. The Blind & Shutter Store’s window blinds & shutters experts know that each Denver home is unique, and your window blinds and shutters should be consistent with the aesthetic of your home. We provide top-notch window blind installation and shutter installation, using only top trusted brands, that will last for years to come. Our blind and shutter installation technicians do it right the first time, so the only reason you would need to call us back is for a routine cleaning and more superior service! At The Blind and Shutter Store, we trust our shutter and blind repair, installation, and cleaning services will be above satisfactory, which is why we want our Denver area residents to feel confident that they will continue to get excellent service even after the job is done. Ask us about our limited lifetime warranties on our comprehensive window blind and shutter services. The Blind and Shutter Store provides affordable, customized window tinting services so you can maintain privacy in your Denver home, while still being able to enjoy the views outside! Call 303-834-1020 or fill out the form to learn more about our services!